Atlanta is great for celebrity spotting! This is me with Roseanne Barr just last night. In addition to being a total tourist, I also love celebrity spotting. I was hooked when I got to meet Leonard Nimoy at the National Press Club in Washington, D.C. (I later met Mary Tyler Moore, Gavin Menzies, and Elie Wiesel at the same venue). 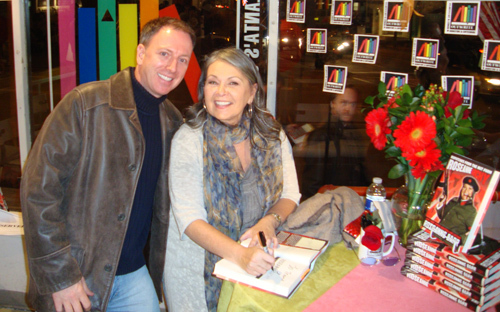 I met Roseanne at a book signing event, which is how I've met quite a few celebrities. Roseanne read 14 pages of her new book and then took the time to chat with those of us there for an autograph. Other places in Atlanta to meet celebrities (usually book signings) are the Margaret Mitchell House, the Carter Presidential Library, and of course Borders. ATLANTApix of the tourATLANTA blog features a "photo-of-the-day" of Atlanta. Come back tomorrow for a new one! Medieval Times has a new Queen! Atlanta Blooms! 2018 - 80,000 Tulips and others! This is a particularly beautiful species of centrolenid - the Granular Glass Frog, Cochranella granulosa. 2019 Copyright Travis Swann Taylor. Simple theme. Powered by Blogger.